Content Planning & Development | Contentworks Inc.
Research data management is embedded in everything we do, from historical research to built heritage evaluations to public consultations. We provide solutions for electronically tracking, storing and accessing documents and information. In collaboration with information management/technical (IM/IT) specialists and librarians, team members can provide advice on technical solutions to fit specific project requirements. Planning and creating content for exhibits, publications and special promotions is an important element of our work. In collaboration with exhibit designers, we have developed story lines, negotiated rights, prepared texts and captions, reviewed texts and drawings for accuracy and mapped out learning objectives. We have even developed learning products to meet curriculum expectations across Canada. As a team, we understand the steps required to move from an idea to a fully developed product – whether it’s for use in a classroom, museum, online or in print. Film makers and publishers use our services to ensure that images, sound and film content is correctly credited and appropriate to the story line of documentary productions. Creating useful, rich web content for online exhibits and publications is one of our specialties. Most of our clients work in the areas of cultural, Indigenous experiences and history, and built heritage. They need reliable, carefully crafted content based on authoritative sources. Contentworks helps them set priorities to get challenging content online and ensures that the right skills are brought together to make it happen on time and on budget. Knowledge about the land, heritage resources and relationships between populations over time and across landscapes is difficult to communicate effectively without maps and other forms of graphics. Contentworks works with consultants in geomatics, graphic design, architecture and landscape architecture to help put information on maps by delivering data that can be used effectively by professionals working with a wide range of tools. Project: Historic Treaties Web Site. Photo: Paying treaty at Fort Simpson. 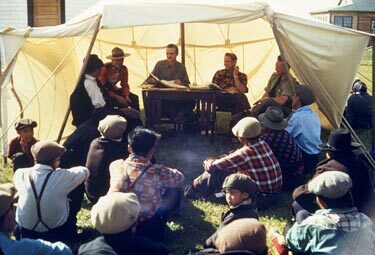 South Slavey people gather with federal government officials and RCMP, c 1954. Credit: Terrance Hunt / NWT Archives, N-1979-062-0242 (1620072).